Our instructors are all lifeguard and CPR certified. Not only that—learn to surf with locals. Trust our friendly team of born and raised locals to help you succeed. We take the utmost care to make sure every student is comfortable, from the moment your feet leave the shoreline to the last wave you catch! Our group lessons offer that perfect mix of individual attention in a team environment! Four students per instructor. Our semi-private lessons (two to three students per instructor) are great for couples, friends/family, or children, with a focus on fun. These offerings allow more one-on-one time with your instructor. Join one of our experts as we search for the big island’s best surf! On this tour, you’ll encounter everything from beginner waves to expert reef breaks. Each adventure is based on the surfers’ abilities and the current swell. Call or email us for options! No experience necessary! Our knowledgeable instructors will have you on the water, paddling with proper form and maneuvering all in one lesson. 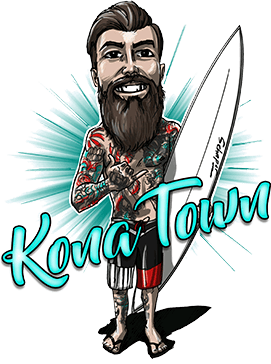 No matter what your level of experience or fitness is, our instructors will have you comfortable on the board and paddling by the end of your two hour lesson, enjoying the Kona coast line. Ever just wanted to go on an adventure? Let us guide you to the secluded valley waterfalls and the green sand/black sand beaches native to our area! We offer 4x4 tours to the island’s most beautiful local spots that you might otherwise miss. There is a fun filled adventure waiting for you family. Give us a call for rates and locations!